Last week whilst I was in London I decided to head over to Covent Garden to do some serious makeup shopping – it would have been rude not to! Covent Garden is my favourite place to shop for makeup when I’m in London and I knew I needed to take a trip into the fairly new Charlotte Tilbury store. Walking in the door felt like I was stepping into a magical world of makeup so I obviously ended up going on a little rather spendy haul. Charlotte Tilbury is someone that I’ve admired the work of for many years, she really is an artist when it comes to makeup. When she released her own cosmetic line a few years ago it took the blogging world by a storm. 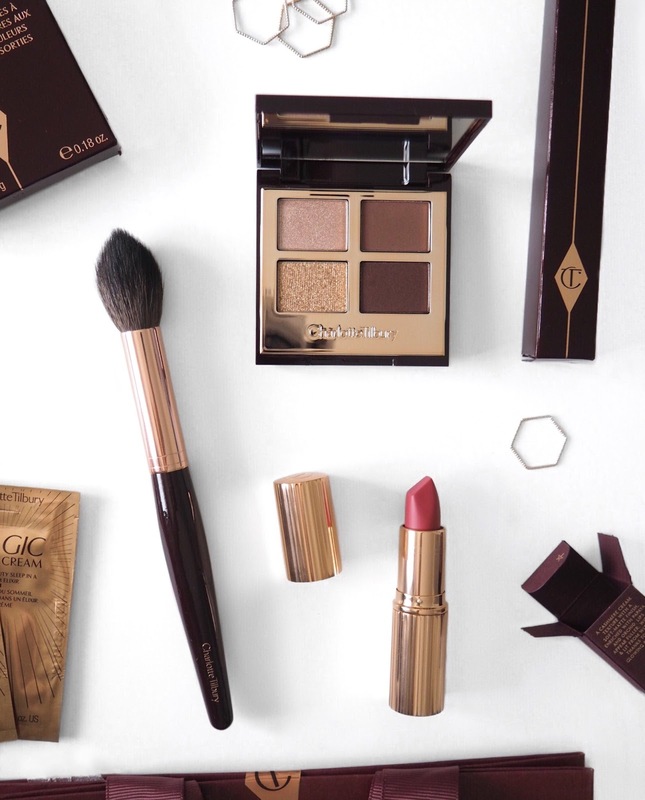 Whilst it is on the pricey side I get along well with so many of her products so I don’t mind handing over the cash – there’s something so elegant and addictive about that rose gold and burgundy packaging! When I first entered the store I was in some kind of makeup zone and I found myself a bit lost in the world of makeup. I could have easily spent a lot more time in there than I did because it’s just so beautiful inside, but being in a super busy area of London meant it was so crazily busy that even getting near one of the counters was a battle so I just had a little look and settled for the items on the top of my CT wishlist. The first thing I picked up was the Powder and Sculpt Brush which has been on my wishlist for a while now. I’ve heard so many great things about this brush and I think it’s going to be the perfect addition to my ever-growing brush collection and can hopefully give me some half decent cheekbones. It’s so soft and fluffy and applies product perfectly, it really was love at first sweep. The next thing I picked up was another wishlist gem that I’ve been lusting after for an eternity now, the Matte Revolution Lipstick in Amazing Grace. This lipstick is unlike anything I already own and it’s not the type of shade I usually go for but there was something so eye catching about it that I couldn’t resist purchasing it (said every makeup addict ever). Amazing Grace is a warm pinky coral that’s going to be perfect for the summer time. The formula is really comfortable to wear and it’s just such a pretty shade. The last thing I purchased was the Vintage Vamp Palette, a quad containing 4 very Samm style purple/burgandy themed shadows and a sparkly gold that all call my name. I already have the Dolce Vita Palette which I adore, so I’m looking forward to giving this one a try! 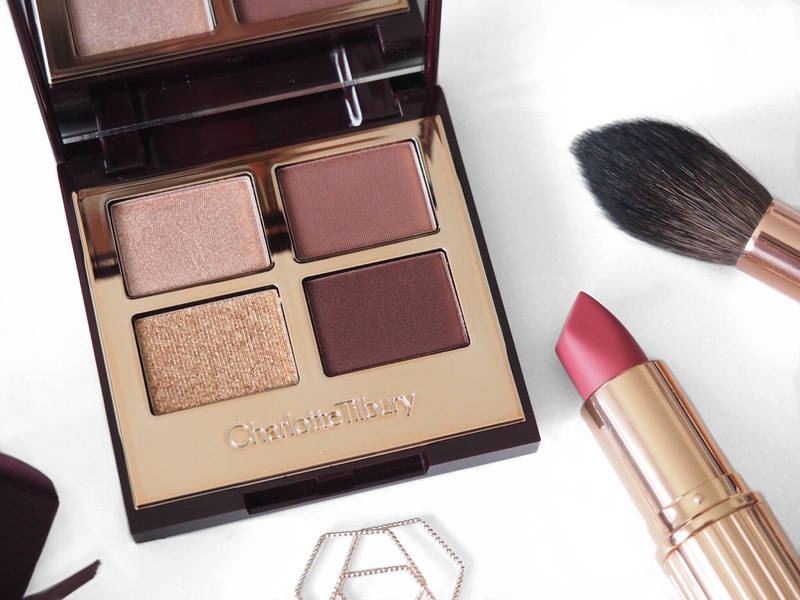 So that’s everything I picked up, have you tried much from Charlotte Tilbury? If so, what are some of your favourites?